WW2 Russian battlefield military trip of Moscow, Stalingrad and Kursk. Eastern front group package tour. During the tour you will visit the four cities where the most important battles of the Great Patriotic War (WW2) took place in the eastern front. For the Soviet Union the war began on June 22, 1941. MOSCOW was to have a key role in this devastating war. The initial German plans concentrated on the destruction of the Red Army, and the offensive against Moscow. By the beginning of December some German Nazi formations were only about forty km north west of the Moscow Kremlin. 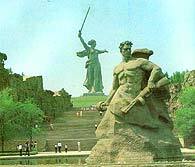 STALINGRAD (now Volgograd) is a place of fierce and decisive battle which is considered by Russians a turning point in the WW2. The city was totally destroyed in the battle. KURSK BATTLE. The battle at the railway station Prokhorovka on the sourthern shoulder near Kursk is known as the biggest tank battle in the history of mankind. Russians consider Rokossovsky operation near Poniry, Olkhovatka and Teplov Hights on the northern salient to be a diamond operation for great planning and accuracy in fulfillment. The Nazi armies could not recover after these defeats on the eastern front. NAPOLEON INVASION OF RUSSIA IN 1812. MAY, JULY trips 2019 (guaranteed departures). WW2 battlefield tour is a unique opportunity to see the main battlefields in the eastern front of the Second World war. The tour covers all main battle sights including Moscow, Stalingrad and Kursk Buldge with Ponyri, Olkhovatka, Teplov Hights and Prokhorovka. We visit main museums dedicated to the Great Patriotic war in Moscow together with some sights which require special permits like Kubinka tank and Monino military aviation museums. Another highlight is the city of Stalingrad which is a museum under open air by itself where combat took place through out the city. Our city visits include Mamaev Kurgan (Mamaev Hill) with enormous monument of Mother Russia, Ludnikov's island, Factory district, Grain Elevator. Upon arrival to Kursk you have a unique opportunity to see the northern salient of the battle with key points of German offensive at Poniry, Olkhovatka and last point of Russian defense at Teplov Hights. These battle sights were called "the Stalingrad of Kursk battle" by german soldiers but nowadays these battle sights are almost never visited even by specialized groups. The second day during Kursk battle visit will be given to the southern bulge with the biggest tank battle at Prokhorovka. The tour is a wonderful opportunity to learn incredible details of main battles of Stalingrad, Kursk and Moscow that took place during Great Patriotic war, ask questions and discuss the course and controversy of the fighting together with other participants of the group interested in military history. Days of the Great Patriotic war battlefield tour in the eastern front. Moscow - Stalingrad - Kursk battlefield trip. DAY 1. We arrive in Moscow. Upon arrival, we check into our hotel for one night, with balance of day to rest and relax. Tonight we gather for a Welcome Dinner and tour briefing. DAY 2. Today we drive outside of the city to enjoy a tour of the Monino Military Aircraft museum. The museum is part of a military airbase and traces the history of Russian aviation from the first days up to the present. In the afternoon we visit the superb Museum of the Great Patriotic War on Poklonnaya Hill. DAY 3. Drive out to the massive Tank Museum at Kubinka with its huge collection of WW2 armoured vehicles, which has only just recently been open to Westerners. After lunch we visit newly opened Patriot Park where main WW2 German, Japanese and some Soviet equipment has been moved. DAY 4. This morning we take a tour around central Moscow including the GUM department store, Lubyanka Square, Red Square and Lenin's tomb before we catch the flight to Volgograd (Stalingrad) (dinner in flight) and check into our hotel for two nights. DAY 5. Full day exploratory tour of Stalingrad battle including the northern part of the city with the Mamaev Hill, the Factory District, the Volga river crossing, the Lyudnikov's island, and the southern part of the city with the Grain Elevator, the Bold Hill and the central with the Paulus last HQ and the Stalingrad panorama. DAY 6. We take a boat trip up the Volga past the giant Mother Russia monument and up to the Factory District. There will be an opportunity for some free time before we catch our return flight to Moscow (dinner in flight). Check into our Moscow hotel for one night. DAY 7. There will be an opportunity for some free time in the morning before we start the day with meeting and lunching with war veterans in the Counsel of Moscow Veterans. Meeting with veterans will take place in case we have five and more travelers in our group. The visit of the Armed Forces museum will take place in the second part of the day. We will have a chance to look at the Soviet and German relics of the Second World War before we catch the overnight train to explore Kursk battle late in the evening. DAY 8. We will arrive to Kursk early and take a trip to Poniry Station to look at the events within the 'northern shoulder' and last Soviet defense line on Teplov Hights. In the afternoon we will have time to visit the Rokossovsky HQ. Overnight in the hotel located in Kursk. DAY 9. Drive to Jakovlevo and follow the 'death ride' of the Fourth Panzer Army. Explore the battlefield around Prokhorovka, the furthest extent of the German advance. Visit the museum and monuments at Prokhorovka (including the preserved trenches and gun emplacements) before we drive further to Belgorod and catch the overnight train to Moscow. DAY 10. Early arrival to Moscow will allow to catch your afternoon flights home. Saint-Petersburg extension is available for Moscow-Stalingrad-Kursk battlefield trip. Please e-mail us for itinerary. THE COST of the WW2 Battlefield tour is USD3990 or 319200 roubles per person in double supplement (sharing a room). Add USD690 or 55200 roubles for single supplement in hotels. Add USD490 or 39200 roubles for single supplement in train. IMPORTANT. All prices are not a public offer and provided only for information purposes. All quotes are the matter of change without notice unless confirmed. In case of rouble payment, please, verify the rate in correspondence with MICEX usd/rouble rate of exchange. Please, check rouble price of your tour with our office staff to avoid misunderstanding. CONSOLIDATION. We would like to make this trip more affordable escaping single supplement fees by sharing a room with another tour participant of the same gender. Let us know if you want to share a room with a male WWII tour participant during our trip July 5-14, 2019. HOTELS in Moscow, Volgograd (former Stalingrad), Mestechko Svoboda near Kursk along the route. MEALS half board (breakfast and lunch) half board starts with breakfast on the second day of arrival and ends with breakfast on the day of departure. Lunch with veterans. BUS service as per program, including transfers on the first and the last days of the trip. In case your flight is at a different time from the rest of the group a separate fee for a transfer is applied. TRAIN TICKETS as per program. AIRFARE IN RUSSIA as per program. ENGLISH SPEAKING GUIDE SERVICES along the trip. GUIDE SERVICES in museums as per program. ENTRANCE FEES in all museums as per program. OPERATION BARBAROSSA TRIP (guaranteed departure). This WW2 battlefield trip is recommended for travelers who are visiting Russia for the first time and interested in exploring World War II Battlefields in the Eastern Front. The tour is organized in cooperation with US Tour Operator Alpventures http://www.alpventures.com/operation_barbarossa_tour.html Alpventures. The tour will give you an overview of the battles that took place from 1941-1945. It covers the most significant museums and battlefields in Saint-Petersburg, Moscow and Stalingrad. Days of the battlefield tour. September, 23 to October 5, 2019. Arrival to Saint-Petersburg. Transfer to hotel. Dinner and tour briefing. Breakfast in hotel. Full day of free time for optional excursions in St. Petersburg. Lunch on your own. DAY 3. Wednesday. St. Petersburg (Leningrad) We start our tour with the Defense of Leningrad museum (we hope it will be opened in 2019 since it is undertaking renovation) and visit the Cruiser Aurora. Lunch. Afternoon tour of the Russian Artillery Museum. Dinner. Overnight St. Petersburg. Overnight St. Petersburg. Breakfast in hotel and check-out. Tour of the Peter and Paul's Fortress. Lunch. Tour the famous Hermitage Museum. Tonight we enjoy traditional Russian Folklore Show. Overnight train to Moscow. Breakfast in train. Arrival to Moscow. Sightseeing tour of Moscow including the GUM department store, the Lubyanka Square,the Red Square and the Lenin's tomb. Lunch. Tour of the Poklonnay Hill and Great Patriotic War Museum. Check in at our hotel. Overnight Moscow. Breakfast in hotel. Drive out of Moscow to explore the impressive Tank Museum in Kubinka., which has been just recently opened for foreigners. After lunch we continue in newly build Patriot Park to look at WWII German, Japanese and more Soviet equipment. If time allows we will visit the Moscow Defense Museum. Breakfast in hotel. Tour of the Central Museum of Armed Forces. Lunch. Afternoon flight to Voglograd to explore battle of Stalingrad. Overnight Volgograd. Breakfast in hotel. Full explanatory Stalingrad battle tour including northern part of the city with factory district, Ludnikov Island and the Mamaev Hill. Lunch. In the afternoon we continue in the southern part of the city with the Grain Silo and the Bold Hill. Overnight Volgograd. Breakfast in hotel. Tour of the Stalingrad Panorama and boat cruise along the beautiful Volga river. Lunch. Afternoon flight to Moscow. Late arrival to Moscow. Overnight Moscow. Breakfast in hotel. Tour of the Monino Military Aircraft Museum. Lunch. Afternoon Shopping at the Izmailovo fleamarket. Breakfast in hotel. Full free day for optional excursions and/or sightseeing in Moscow. Lunch on your own. Overnight in Moscow. Breakfast in hotel. Tour of the Moscow Kremlin with audio-guide. Meeting with veterans and lunch in the Council of Moscow Veterans. Afternoon free time. Overnight Moscow. DAY 13. Saturday. Breakfast in hotel. Transfer to airport. Kursk extension is available for the Barbarossa tour. DAY 12. Friday. Breakfast in hotel. Tour of the Moscow Kremlin with audio-guide. Meeting with veterans and lunch in the Council of Moscow Veterans. Free time in the afternoon. Late in the evening we catch overnight train to Kursk. DAY 13. Saturday. Breakfast in train. Full day Guided Tour of Kursk Battlefield, beginning with a drive to Ponyri Station to look at the events within the northern shoulder. Visit Teplov Heights - the last point of Soviet defense. Lunch. Afternoon Tour of Rokossovsky's Headquarters. Dinner. DAY 14. Sunday. Breakfast in hotel. Full day Guided Tour of Kursk Battlefield of the southern salient. Drive to Jakovlevo and follow the "death ride" of the Fourth Panzer Army. Lunch. This afternoon, we will explore the battlefield around Prokhorovka, the farthest point of the advance. Visit the monuments at Prokhorovka including the preserved trenches and gun emplacements. Continue to Belgorod to catch overnight train to Moscow. Dinner in train. DAY 15. Monday. Breakfast in train. Early arrival to Moscow will allow you to catch your afternoon flights home. THE COSTof the main WW2 Battlefield tour is USD5295 or 423600 roubles per person in double supplement (sharing a room). USD6495 or 519600 roubles for single supplement. THE COSTof the Kursk extention is USD1395 or 111600 roubles per person in double supplement (sharing a room). USD1995 or 159600 roubles for single supplement. HOTELS in Saint-Petersburg, Moscow and Volgograd (former Stalingrad) along the route. MEALS half board (breakfast and lunch) except Day 1, have board starts with dinner on the day of arrival and ends with breakfast on the day of departure. WINTER TRIP IN JANUARY 2020 (guaranteed departure). Main German assaults on to the Soviet Union took place in summers of 1941 and 1942. German's leader was so confident that the Soviet Union will fall like a giant on clay legs if it is pushed hard enough that he forbid his generals even mention any possibility of fighting during winter time. Overconfidence of German troops and underestimation of the Red Army led Wehrmacht to disasters during winter campaigns at Moscow and Stalingrad. One can read and hear about Russian winter many times but it is not possible to comprehend the conditions until one experiences it in person. This trip is put together to give you a chance of taking a glimpse of Soviet and German soldiers experience of the period. We also invite you to celebrate the New Year on the Red Square. DAY 2. This morning we take a tour around central Moscow including the GUM department store, Lubyanka Square, Red Square and Lenin's tomb before we depart to catch the evening flight to Volgograd (Stalingrad) and check into our hotel for two nights. DAY 3. Full day exploratory tour of Stalingrad battle including the Mamaev Hill, the Factory District, the Grain Elevator, the Volga river crossing, the Lyudnikov's island, the Paulus last HQ and the Stalingrad panorama. DAY 4. There will be an opportunity for some free time before we catch our return flight to Moscow. Check into our Moscow hotel for one night. DAY 5. Drive out to the massive Tank Museum at Kubinka with its huge collection of WW2 armoured vehicles, which has only just recently been open to Westerners. After lunch we visit the superb Museum of the Great Patriotic War on Poklonnaya Hill. In the evening we catch overnight train to explore the Kursk battle. DAY 6. We will arrive to Kursk early and drive to Jakovlevo and follow the 'death ride' of the Fourth Panzer Army. Explore the battlefield around Prokhorovka, the furthest extent of the German advance. Visit the museum and monuments at Prokhorovka (including the preserved trenches and gun emplacements). Overnight in the hotel. DAY 7. In the morning we take a trip to Poniry Station to look at the events within the 'northern shoulder', Olkhovatka and last Soviet defense line on Teplov Hights before we return to Kursk and catch the overnight train to Moscow. DAY 8. Today we have some free time and head for the airport to catch the flight back home. THE COST of the WW2 Battlefield tour is USD2990 or 239200 roubles per person in double supplement (sharing a room). Add USD490 or 39200 roubles for single supplement in hotels. Add USD490 or 39200 roubles for single supplement in train. MEALS half board (breakfast and lunch), half board starts with breakfast on the day of arrival and ends with breakfast on the day of departure. Lunch with veterans. PATRIOTIC WAR OF 1812 TOUR. NAPOLEONIC INVASION (guaranteed departure). Russia experienced two patriotic wars in its history. They are called patriotic because the whole country and the whole nation was involved in the combat. Napoleon in 1812 and Wehrmacht in 1941 launched their offensives putting Russia at the edge of its existence. It took the entire country to stand up and fight to defend its independence. Russian people had to go through bitter defeats and terrible losses, through huge casualties and personal tragedies to temper the spirit and banish invaders out of the country. The tour is designed to give you an opportunity to learn more about both wars and visit the sight of the most decisive WWII battle in Stalingrad. Arrival to Moscow. Guided transfer to hotel and accommodation for six nights. Dinner and tour briefing. MORNING Breakfast in hotel. Drive 140 miles out of Moscow to enjoy full day visit to Borodino, the main battlefield of the Patriotic war against Napoleon. Lunch. AFTERNOON Return back to Moscow. MORNING Breakfast in hotel. Today we visit Borodino Panorama in Moscow to look at the artistic depiction of the famous battle. Lunch. AFTERNOON Sightseeing tour of Moscow including the GUM department store, the Lubyanka Square,the Red Square and the Lenin's tomb. MORNING Breakfast in hotel. This morning we start with the visit of the Poklonnay Hill and Great Patriotic War Museum which will give you an overview of the main battles that took place during the Great Patriotic War. Lunch. AFTERNOON The second part of the day will be dedicated to the exploration of the magnificent Moscow Kremlin with audio-guide. MORNING Breakfast in hotel. Today we visit the Armed Forces museum with the collection of artifacts from the old days up to the present. Lunch. AFTERNOON The Moscow Defense Museum will tell us the story of Germans offensive over Moscow and Soviet counter attack. MORNING Breakfast in hotel. Drive out to the Monino Military Aircraft museum which has a great collection of WWII and after war Soviet planes. Lunch. AFTERNOON Return to Moscow and some free time. DAY 7. Friday. Volgograd (former Stalingrad). MORNING Sack breakfast from the hotel. Early morning flight to Volgograd to explore the battle of Stalingrad. Accommodation in hotel for one night. Lunch. AFTERNOON After lunch we will drive to the Factory District, to look at the Tractor and Barrikady factories. DAY 8. Saturday. Volgograd (former Stalingrad). MORNING Breakfast in hotel. Full day exploratory tour of the Stalingrad battle including the Mamaev Hill, the Grain Elevator, the Volga river crossing, the Lyudnikov's island, the Paulus last HQ. Lunch. AFTERNOON We visit the Stalingrad panorama before we drive to Gumrak former German airfield to catch our flight to Moscow. Dinner in flight. Late return to Moscow and accommodation in hotel for two nights. MORNING Breakfast in hotel. Drive out to the massive Tank Museum at Kubinka with its huge collection of WW2 armored vehicles, which has only just recently been open to Westerners. After lunch we will visit Patriot Park where the majority of WWII German equipment has been moved. THE COST of the WW2 Battlefield tour is USD3990 or 319200 per person (double supplement). Add USD890 or 71200 roubles for single supplement in hotels. IMPORTANT. All prices are not a public offer and provided only for information purposes. All quotes are the matter of change without notice unless confirmed. In case of rouble payment, please, verify the rate in correspondence with MICEX usd/rouble rate of exchange. Please, check rouble price of your tour with our office staff to avoid misunderstanding. Travel agents and tour leaders please contact Oleg Alexandrov at oalexandrov@mtu-net.ru for SPECIAL OFFER on this tour. HOTELS in Moscow, Volgograd along the route. MEALS full board (lunch and dinner), f.b. starts with dinner on the day of arrival and ends with breakfast on the day of departure. WW2 and battlefields related tours.